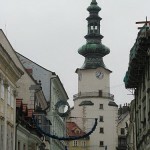 St. Michael’s Tower is the only watch tower still standing in Bratislava and it gives a visitor to Bratislava a nice view over the city. As you walk the stairs up to the tower you can enjoy the Arms and Municipal Fortifications exhibition and from the top of the tower you will be able to enjoy a beautiful view over Bratislava, especially towards the Castle. 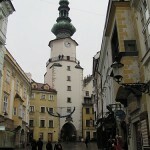 The tower is one of the oldest buildings in Bratislava, originally built around year 1300. It received its current form after reconstructions in 1758. Under the Michaels gate you can find a street full of luxury shops, for example: Christian Dior, Ralph Lauren, Louis Vuitton, Dolce & Gabbana, Ed Hardy, Tommy Hilfiger, Calvin Clain, Gucci, Versace, Prada, Swarowski, Tiffany’s, Bvlgari and many others.